Discover South Iceland's raw natural wonders Icebergs, hot springs and volcanoes dominate Iceland's beautiful yet rugged landscape. On a guided coach tour, experience the hidden powers of the island including dramatic vistas of the notorious Eyjafjallajökull volcano and the breathtaking Glacial Lagoon. With several overnights in stunning rural locations, you'll be perfectly situated to hunt for the magical Northern Lights. Iceland is one of the best places in the world to experience this majestic phenomenon. Welcome to Iceland! Arrival in Reykjavik and shared transfer by Flybus to your hotel. Overnight stay in Reykjavik. 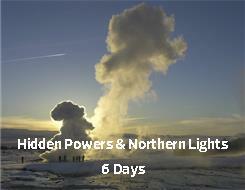 Important: If you have added extra nights in Reykjavík before your tour, the guide will meet your group for the start of the tour on Day 2 according to the standard "Hidden Powers and Northern Lights" itinerary. Centre in Reykjavik for an exciting and informative presentation on the Northern Lights. Then head onwards to Thingvellir National Park (UNESCO World Heritage site) where the world's oldest parliament met for centuries on the shores of Iceland's largest lake. Continue through farmland areas to the geothermal fields of Geysir with bubbling mud pools and the high-spouting Strokkur hot spring. Last but not least, visit the dramatic two-tiered Gullfoss waterfall, a spectacular sight in winter when frozen mid-cascade. Stop at Skalholt, Iceland's capital during the Middle Ages and now a culture centre with a beautiful church. During the day you will also visit Laugarvatnshellir cave where two Icelandic families built a cozy homestead and farm during the early 20th century. The furnishings and buildings in the cave has been restored to show how the residents once lived. Dinner and overnight in the south coast area. Drive along the south shore, an area of Iceland that is beautiful to view in the winter. This is one of the main farm regions of the country, and the road will pass by typical Icelandic farms, often with Icelandic horses in the fields. This part of Iceland is home to the new Lava Centre, an interactive, high-tech educational exhibition depicting volcanic activity, earthquakes and the creation of Iceland over millions of years. Enjoy both the exhibit and viewing an interesting film about Icelandic volcanoes at the center's cinema. Stop at the spectacular waterfalls Seljalandsfoss and Skogafoss. Head onwards, passing by Myrdalsjokull Glacier, to visit Reynisfjara beach. Take a walk on the black sands, and admire the extraordinary rock formations and thundering waves of the Atlantic Ocean. Dinner and overnight stay in Kirkjubaejarklaustur area. Approximate distance: ca255km / 158miles Western Europe's Largest National Park - Glacial Lagoon with Icebergs - Europe's Largest Glacier Today enter the southern area of Vatnajokull National Park, named after Europe's largest glacier. This national park is also the largest one in Western Europe. Drive through vast sand plains created by glacial outwashes as you head east en route to the Vanajokull area. Visit Jokulsarlon Glacial Lagoon where you can enjoy a breath-taking sight of icebergs floating in the fantastic 180m (591 ft.) deep glacial lagoon. Then view Svinafellsjokull, one of the most beautiful of the glacial outlets emerging from Vatnajokull. Visit the national park's famous Skaftafell area, a site of outstanding natural beauty dominated by Vatnajokull glacier. Return to the hotel for dinner and overnight. geothermal area. Hveragerdi is often called "The Flower Village" because of its many greenhouses heated by hot water from nearby springs. Follow along the coastline with its breathtaking waves and through a deserted community that once was a flourishing centre for the region. On to the Reykjanes peninsula, where you can enjoy a dip in the famous Blue Lagoon, a unique wonder of nature with pleasantly warm, mineral-rich water in the middle of a black lava field. Return to Reykjavik, where the evening is at your own leisure. Dinner is on your own. Transfer to the international airport for your departure flight. We recommend you depart your hotel no later than three hours before your departure flight.